Private airlines Sibir and Globus, which comprise S7, Russia’s second largest airline grouping, flew a record 15.96 million passengers in 2018, up 12 per cent year-on-year. With data collected by Russian aviation authority Rosaviatsiya revealing that Sibir’s 2018 total reached 11.6 million passengers (up 16.9 per cent), it means that Globus’s performance remained virtually level at 4.36 million in the same period. The data also shows that Sibir, the country’s largest individual private air carrier, regained second place in Russia’s ranking of airlines, behind Aeroflot but ahead of Aeroflot Group subsidiary Rossiya Airlines, which served 11.1 million passengers last year. In their key, domestic markets, the two airlines – working under their S7 Airlines brand – transported some 11.55 million passengers, 10.5 per cent more than in 2017. Growth on international routes, which helps to generate hard currency, was 16 per cent. In 2018, the airlines collectively transported 4.41 million passengers on international flights. Revenue passenger kilometres (RPKs) improved by 11.2 per cent over the course of the year, reaching 33.17 billion. In 2018, S7 Airlines continued its fleet modernisation programme with the delivery of several latest-generation aircraft: four Airbus A320neos, an A321 neo and two Boeing 737 MAXs, thus joining the list of the first Russian operators of the types. “In addition, we completed the development of our Embraer E170 regional aircraft fleet. This made it possible [for us] to expand the route network from our hub airports, including starting new flights from Moscow, Novosibirsk, and St Petersburg. Last year, more than 30 new routes were added to the S7 Airlines map, including to some exciting travel destinations such as Reykjavik, Tenerife, Sardinia, Bari, and Nha Trang,” points out Igor Veretennikov, commercial director of S7 Group. 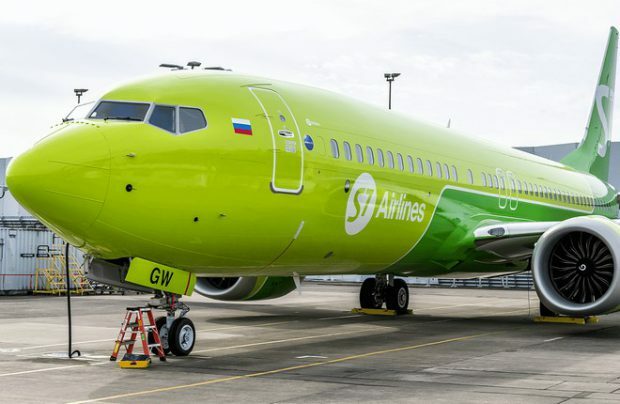 On the technology front, S7 Airlines, together with the Gazpromneft-Aero aviation fuel operator and large private Russian bank Alfa-Bank, last year became the first carrier in Russia to refuel an aircraft using digital smart contracts based on the latest block-chain technology. Also, at the end of last year, S7 Airlines migrated to the Altéa Passenger Service System (PSS), which provides advanced IT solutions in the field of airline resource management, including bookings, ticketing and passenger check-in.